, corresponding to C terminal amino acids 544-557 of Human ARIH1. Our Abpromise guarantee covers the use of ab3891 in the following tested applications. 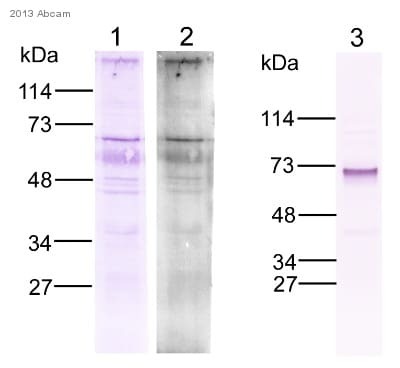 Western Blot: Approx 65 kDa band seen in U937 lysate [Predicted MW of approx. 61kDa according to NP_005735]. Recommended for use at 0.2-1.0µg/ml. Optimal working dilutions / concentrations should be determined by the end user. Might act as an E3 ubiquitin-protein ligase, or as part of the E3 complex, which accepts ubiquitin from specific E2 ubiquitin-conjugating enzymes, such as UBE2L3/UBCM4, and then transfers it to substrates. Belongs to the RBR family. Ariadne subfamily. Contains 1 IBR-type zinc finger. Lanes 1 and 2 - 12% SDS-PAGE. Lane 3 - 4-15% SDS-PAGE. Lanes 1 and 3 - developed with colorimetric substrate. Lane 2 - developed with ECF+. ab3891 staining (0.5µg/ml) of U937 lysate (RIPA buffer, 30µg total protein per lane). Primary incubated for 1 hour. Detected by western blot using chemiluminescence. ab3891 staining (0.5µg/ml) of U937 lysate (RIPA buffer, 30µg total protein per lane). Primary incubated for 1 hour. Detected by western blot using chemiluminescence. Publishing research using ab3891? Please let us know so that we can cite the reference in this datasheet.